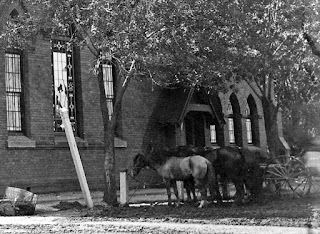 As someone who takes great pride in knowing things nowadays that are out of date, like how to drive a stick-shift car, it's been making me think about how some people in old-time Phoenix must have felt about their expertise with horses, which became obsolete very quickly. Automobiles (horseless carriages) replaced horses so quickly that even basic knowledge of horses must have become rare with the younger generation, who became fascinated with carburetors, and that sort of thing. Let's time-travel and take a look. I, of course, know nothing about horses, so this story will show my ignorance. These old-timers would realize that! "Well, will you look at that! Can you believe how sloppy that harness is tied! Must belong to the younger generation! And that roan isn't even tied to larboard, my grandpappy would have had a fit at seeing a team like that. And what kind of knot is that? In my day, folks knew what to do, what type of carriage to set to, how to tie. I don't believe the younger generation could even saddle a mare without help from one of them-thar mail-order books. Ha! My grandpappy, and his grandpappy, and his grandpappy, were all good horsemen. Most of them could shoe, and handle a team by the time they were knee-high to a grasshopper. Now I don't expect you could find a young person who knows how to plow with a team, or or what to do if a shoe is thrown. Don't know what this world is coming to! I saw one of them "horseless carriages" just the other day here in Phoenix, you wouldn't get me anywhere near one of those things! Here Clem, watch this - I'm-a-gonna sneak up on that team parked there by the church and retie that square with a slip knot. Won't that be a laugh when they try to ride off? And they won't pay no never mind as to how to fix it, I reckon!" 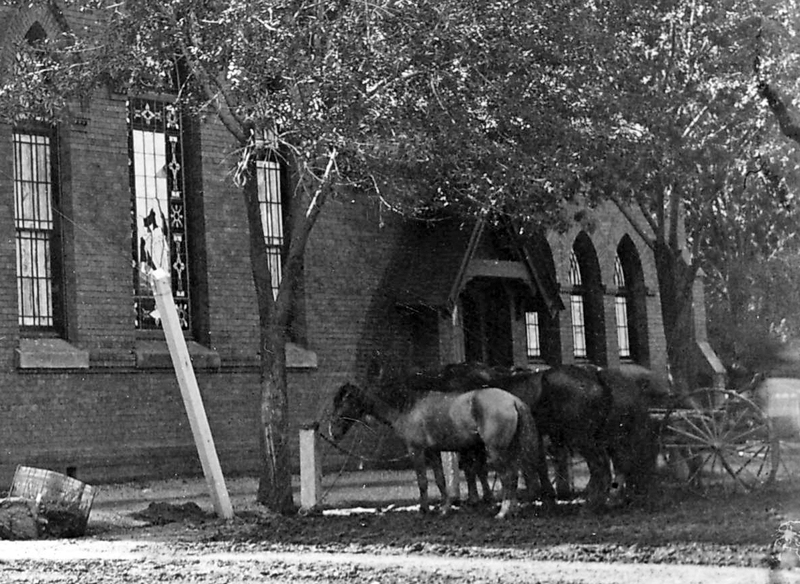 Image at the top of this post: Horses outside of the Central Methodist Church in 1904, southwest corner of Central and Monroe, Phoenix, Arizona.